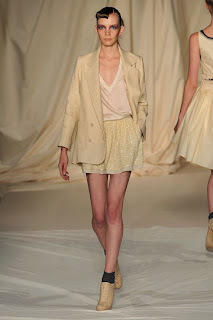 For Cynthia Rowley’s Spring 2010, there are sequined pieces, slashed ribbon dresses and evening shorts. Many of the looks are paired with bow tattered canvas mules. Hand dipped, hand painted and bleeding techniques are seen throughout the dresses, on linen and silk fabrics. The collection has a smoky palette, consisting of tobacco, faded violet, phantom blue and grey. 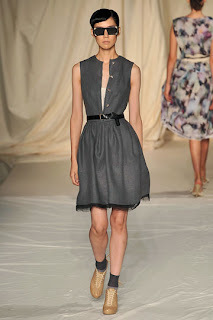 My favorite looks are the bleeding neckline dress with shredded canvas belt, double-breasted jacket with sequin evening shorts, distressed sequin shorts and top with charred pave brooches, raw edged canvas linen dress with pave buttons, shattered sequin cardigan with heirloom pave necklace and blue twilight dress.